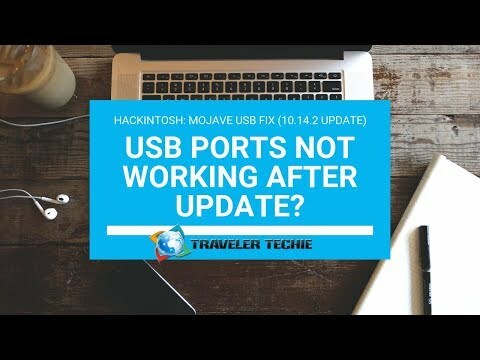 If you have updated your Hackintosh only to find some of your either front or rear USB 2.0 or 3.0 ports no longer working, follow this guide to fix this issue. Download the latest Multibeast for Mojave from Tonymacx86. You will need to login with a free account to download the Installer. Run Multibeast and navigate to the Drivers tab. From the left side, click on USB, and select Remove XHCI Port Limit and USBInjectAll. Proceed with installation and restart your computer. Download the latest USBInjectAll.kext from here. Save it to your Desktop. Download the latest KextBeast from here. Run KextBeast, and choose the Destination for /Library/Extensions. Click Install. Download and open the Clover Configurator from here. From the left side, click on Mount EFI, and next to your proper EFI partition (for APFS, Recovery, Preboot etc) click on Mount Partition. From the File menu click Open. Navigate to EFI, EFI, Clover and then open config.plist. From the left side click on Kernel and Kext Patches. Click the + button at the bottom if you don't have the com.apple.driver.usb.AppleUSBXHCI patch. If you do, just replace the fields with the below values. Click the File menu and Save your config.plist. Close Clover Configurator and restart your computer. All credits go to Tonymacx86.com community.